Among the Scandinavian countries, Denmark is a favourite location for foreign investments. Investing in Denmark is a smart option, as Denmark is perfectly located as gateway to the Scandinavian countries and the Baltic area. The Copenhagen airport is a central hub of Northern Europe. Especially IT companies invest in Denmark. Denmark has one of the most advanced IT infrastructures in Europe. Denmark’s penetration of mobile telephone subscriptions is ahead of the average European level. Denmark is characterised as a top-ranked country with regard to penetration rates for PCs and household Internet (broadband) access. Denmark is in the global Top 5 what regards computers per capita, Internet Users and Broadband Subscribers (IMD 2007). Denmark has a favourable tax climate thanks to a corporate tax rate of 25%, an extensive network of tax treaties and attractive rules for expatriates. Foreigners working in Denmark benefit from the Danish welfare system. In addition, key employees or a researchers may also be subject to the particularly favourable 25%/33% tax regime. 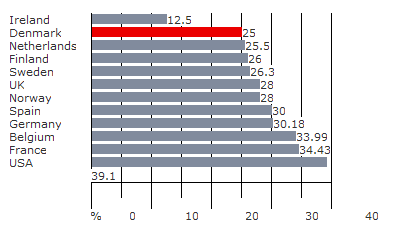 In this regime, employees pay a much lower tax for the first three or five years in Denmark. The Danish workforce is among the most productive in Europe and no restrictions apply regarding overtime work, allowing companies to operate 24 hours a day, 365 days a year. Denmark offers the foreign investor a well-organised labour market with good cooperation between the different parties. In a benchmark study of employment law in 8 EU countries, Denmark comes out as number 1 as being the most flexible. Adding the facts that a Danish employer pays virtually no social security contribution and that Denmark has a stable labour market makes the actual workforce very competitive in comparison with other European countries.